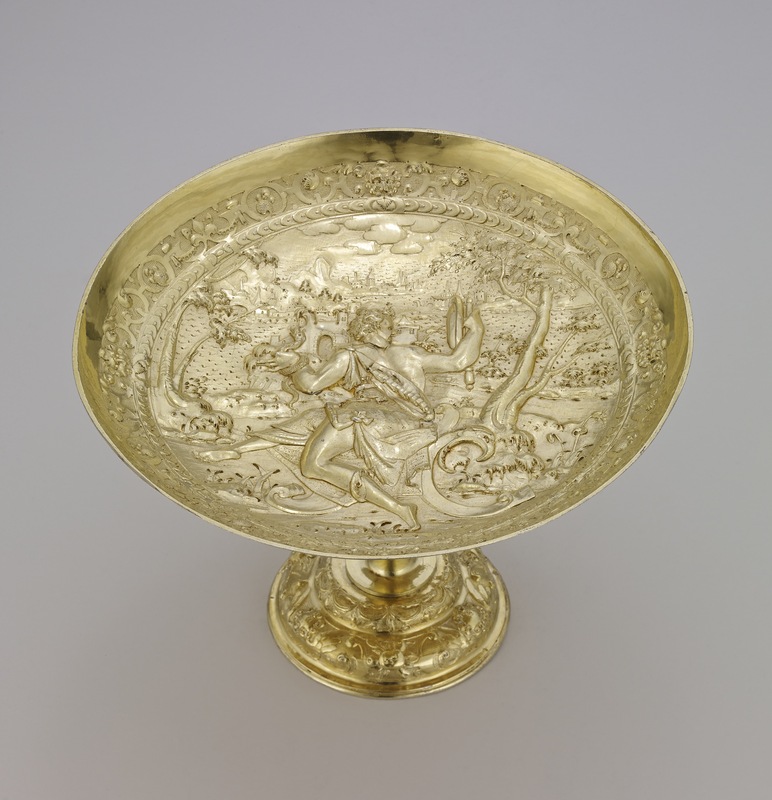 Tazza; silver-gilt; embossed and chased; Prudence in landscape; border of strapwork scrolls etc; inscribed. ; knop chased in relief with festoons, lion masks, etc; inscribed. ; foot similar to border; bottom of foot with convex plate engraved with arms of Count von Thun of Bavaria; inscribed. Origin: Mark of Paul Hübner; Augsburg, c.1595-1600. Commentary: The composition of this Prudence tazza is a subtle variation of the Justice tazza (cat. no. 27), in reverse. The Mannerist device of placing the emblematic figure with her back to the spectator and of seating the figure in a contrapposto pose on a fantastic 'scroll-stool' makes this tazza an ideal 'pair' to the Justice tazza. This bizarre 'scroll-stool' can be found in a far more restrained form in a few of Jost Amman's woodcuts, subsequently included in the ‘Kunstbüchlein’ of 1599, but Paul Hübner has transformed it into a truly prominent compositional feature in the Mannerist style. As Dr Weber has pointed out, this figure of Prudence has a close connection with both the emblematic figure of Air in the Waddesdon Bequest (cat. no. 33) and the 1594 tazza of Prudence in the Palazzo Pitti (Weber 1970, p. 346). The 'scroll-stool' used on the Air tazza is virtually the same, but the contrapposto of the emblematic figure of Air is not quite so extreme. The Jost Amman woodcut of Prudence published in the 1599 ‘Kunstbüchlein’ is not directly related, being rather conservative in style, with the seated female figure facing front and totally lacking any of the bold Mannerist characteristics that give this set in the Waddesdon Bequest their special appeal.